The core of Rooftop Prince that runs through the whole series is Micky Yoochun. In the Rooftop Prince that debuts on the night of March 21st, 2012, Park Yoochun who plays the role of crown prince Lee Gak not only travels between two extremes of contemporary age and Joseon Dynasty, but also has to portray the double life of 3rd generation chaebol who gone missing after accident, making audience not only curious but worry. In the beginning of 1st episode, the scene of crown prince Lee Gak cries due to the death of crown princess is staged, but just after the crying, the the falling into water scene with Yoochun wearing modern outfit appeared. Later in the modern drama, Yong Tae Moon (Lee Tae Sung) and the 3rd generation chaebol cousin Park Yoochun quarrel on the yatch in the sea, and Park Yoochun accidentally fell into the water. Thus, Park Yoochun as a single person will have dual fate of crown prince and chaebol man. But these issues will be solved in the upcoming episode 2 and 3, but ultimately the conclusion from episode 1 is that the core that links through the whole series is Park Yoochun. As Park Yoochun will hve to play not only the role of crown prince, but also the role of ‘stupefied bachelor’ crown prince when colliding with modern culture after coming to contemporary times, coupled with chaebol man Park Yoochun who is treated as missing after an accident. Actually, in the situation that one person has to play 3 roles, the acting is even harder. Rooftop Prince casted the hottest popular young actors Park Yoochun and Han Ji Min, showing that it’s a youthful idol drama that intends to conquer fans around the age of 10 to 20. However, the destinies that associated with a person are so many. With the events that happened and hints have sense of cultural, what is the drama’s development is attracting high expectations. 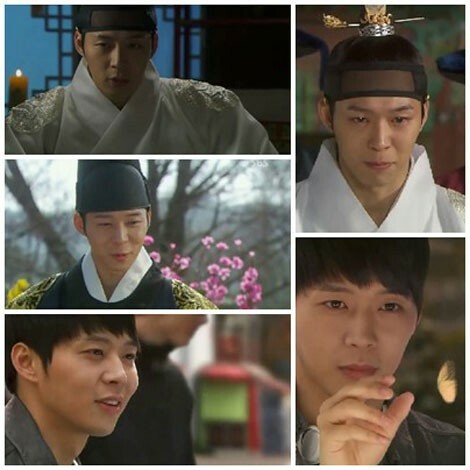 On the day, the acting of Park Yoochun can almost find the shadow of Lee Sun Joon in KBS drama Sungkyunkwan Scandal, but Park Yoochun who smiles simply like a spring when looking at Han Ji Min, and who cries painfully due to the death of crown princess, has shown unlimited potential as an actor in the performance of joy and sorrow.